January 26, 2017 / TheNewswire / Montreal, Quebec, Canada - HPQ Silicon Resources Inc ("HPQ") (TSX Venture: HPQ) is pleased to inform its shareholders that PyroGenesis Canada Inc ("PyroGenesis") has submitted a new stage report entitled "Update on The PUREVAP Process Characterization Testing Phase" pertaining to 36 of 50 tests completed to date. The findings are significant in that they demonstrate the success of bench scale test work in scaling up the process of converting low purity feedstock into higher purity silicon metal. Bernard Tourillon, Chairman and CEO of HPQ-Silicon stated, "Demonstrating the scalability, at lab scale, of the PUREVAPtm QRR process in a repeatable and predictable manner while obtaining consistent purity results of 99.9+% (3N+)1 Si using 98.14% or less (1N) SiO2 feedstock, represents yet another important technical milestones in in our progress toward production of High Purity Silicon metal. At this stage of our development, we have passed the critical milestones of consistently increasing sample size and now work will focus on improving the purity of the final product. This 'iterative' approach of incrementally increasing size, and purity step by step will continue and has so far been highly successful". The report confirms the scalability of the Process, explaining that in order to improve the yield of High Purity Silicon Metal (99.9+% Si) produced per batch, the lab-scale PUREVAPtm QRR reactor was successfully modified and capacity scaled up by a factor of 3 (300%). As a result, yield went from less than 0.1 g to 8.8 g (test #32), an increase of approximately 9,000% (hundredfold). Of significant interest is the fact that all these results were obtained using lower purity feedstock (98.14% or less SiO2) than used by the Silicon Metal industry to produce Metallurgical Grade Silicon Metal (98.5% Si). Moreover, the results suggest that HPQ PUREVAP(TM) QRR PROCESS is the only process in the world that can systematically produce Silicon Metal of a purity above 3N+ (99.9+% Si) from sub-standard purity feed quartz. "We are extremely pleased with the progress to date," said Pierre Carabin, CTO of PyroGenesis. "Our ability to increase capacity by a factor of nearly hundredfold in such a short time gives us great confidence in scaling up the process to the 200 TPY pilot phase". During the Proof of Concept phase, only high-purity quartz (99.97% SiO2) was used, while low-purity quartz (maximum 98.4%) was used for the other 36 tests. Moving forward, some tests will be conducted using higher purity feed stock (99.5% SiO2) in order to study the effect of reducing impurity at the source. Test 19 confirmed that by adding a solid purifying agent into the feedstock, the production of 4N+ purity Silicon Metal (99.99+% Si)2 using 98.14% SiO2 was reachable. The engineering team at Pyrogenesis will continue to evaluate results and make process modifications to the PUREVAP(TM) QRR therefore allowing us to find the optimal purification process. "Producing Solar Grade Silicon Metal remains our primary objective. For the remaining 14 tests, our intention is to focus solely on improving purity, with a goal of producing minimum 5N Si material," said Tourillon. "In addition, PyroGenesis will also test an alternative route to higher purity during the ongoing test work." The R&D lab testing is still ongoing and the project is on schedule for end of February 2017 completion. By the end of the Process Characterization phase, PyroGenesis expects to have conducted 50 laboratory scale experiments. The data collected during the Process Characterization phase is being used for the Pilot Scale design, which is also currently underway. 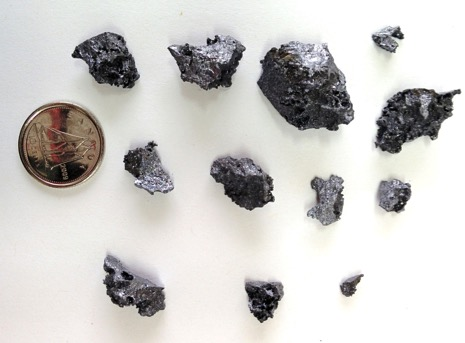 HPQ Silicon Resources Inc is a TSX-V listed junior exploration company planning to become a vertically integrated and diversified High Value Silicon Metal (99.9+% Si), and Solar Grade Silicon Metal (99.999+% Si) producer. Our business model is focused on developing a disruptive High Purity and Solar Grade Silicon Metal manufacturing process (patent pending) and becoming a vertically - integrated High Value Silicon Metal and Solar Grade Silicon producer that can generate high yield returns and significant free cash flow within a relatively short time line.